Sat., September 17th 4:45/5pm * SOLD OUT * sorry !! Right AFTER the BEER HOLDING CONTEST ! Part of the German-American Steuben Day Parade 5th Avenue. 68th - 86th street! This is an 5000 sq feet authentic German beer Hall / Restaurant in the middle of Manhattan, NYC. It gives you that feel of being in MUNICH in the midst of the city that never sleeps. From the food, beer & Schnapps the heavy durable wooden tables & benches, the decor & atmophere and the cute staff dressed in German outfits - this is the place to be! 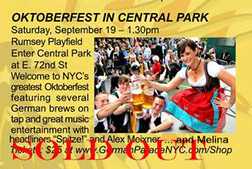 This is part of DUMBO's first annual Oktoberfest, with food vendors, beer trucks, games and all... it's an all day event. It starts with families enjoying the activities and continues with 'LIVE' music with the "MELINA & the Oompahs (on this date) and end up with DJ Sebastian spinning a mix of tunes popular in Germany and other places. Stay Tuned for MORE DATES --- through END OF OCTOBER!! See you at one of my shows!! Check us out on GOOD DAY NY - FOX TV Channel ! MELINA will perform the 'NEW' VERSION of her 'I LOVE GERMAN BOYS' HIT Song! COME JOIN HER ON STAGE as EVERY YEAR !!! right after the 'HOFBRÄU' BEER HOLDING contest with LENNY COYNE ! - MONTAG, den 3. Mai - seit dabei !!! ;-)Ich werde mein Lied "I LOVE GERMAN BOYS" zur MALLORCA SAISONEROEFFNUNG im MEGA PARK singen ! Am 4.5. wird dann einen NEWCOMER AWARD an einem der Künstler ausgezeichnet. 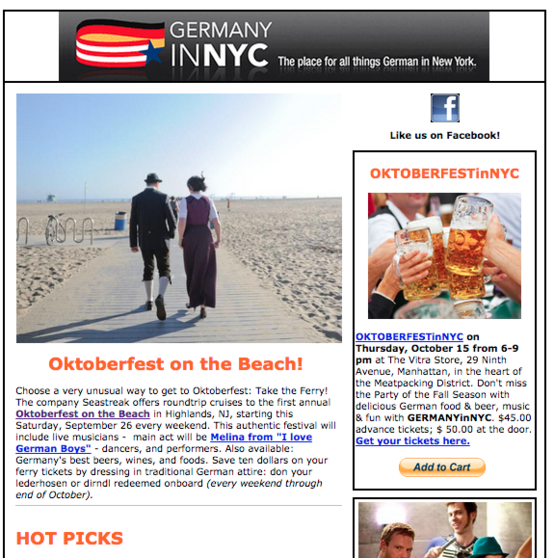 'the Oompah-pah's' at the only Oktoberfest with an OCEAN VIEW!